To reach the border we had to buy a bus ticket to Sunauli. After obtaining the Indian visa as we wanted, we had not much time to cross the border. We decided to go in the evening after receiving passports with visa stamps. 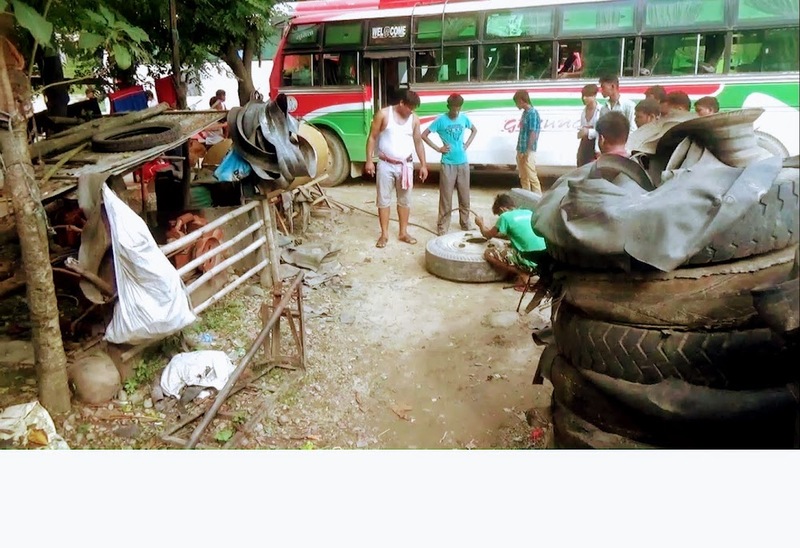 Some travel agents have argued that no overnight bus ticket to Sunauli is available, as the road to the border is closed at night for a distance of thirty kilometers due to a large number of accidents. 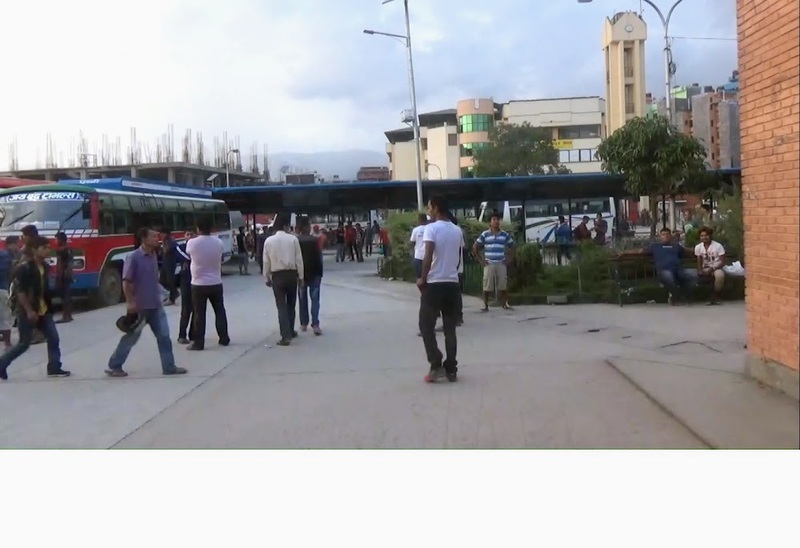 In the end, however, we were recommended to go to Gongabu – New Bus Park – located on the north-western edge of the city. The day before our planned departure from Kathmandu, we went all the brigade for a walk to Gongabu. We headed directly to the window. There was no difficulty in buying a night bus ticket to Sunauli (Belahiya). To the surprise it did not cost 700 or 800, as previously bought tickets Kathmandu – Sunauli. It costed 500 NRS for one place. The surprise was not right – we forgot that the travel agencies we bought before were intermediaries, and the Gongab window is a direct service provider. Departure the next day at 8 pm, 7.30 pm check in of passengers. Our visas were settled successfully on Monday and we headed straight for a walk with all our backpacks, making stops for a beer and coke at Gongabu, not far from the Indian Visa Service Center. The road to the north of the city where Gongabu is located begins with a narrow street along the red wall, just behind the Visa Center. When it was almost 7.30 pm we showed our ticket it the window and they showed us the bus. We packed the toddlers and backpacks to the bus, pressing the driver to put bags in the trunk, not on the roof and we waited calmly on departure. Departure was punctual, scheduled arrival was about 6 am. According to the information we received, Nepal Immigration Office is opened at 5 so that we could immediately cross the border. During the trip the tube has gone in left wheel and at two in the morning they glued it and putted on. Then, in another parking place, the ride stopped slightly longer. Maybe the road was really closed, or maybe the driver decided not to ride with his weak inner tube in the dark after muddy holes created by the monsoon rain. With the dawn the bus started. At six, we were not yet in Belahiya. About seven o’clock the same tube went again. The bus stopped, the service went to see the wheel and then returned, patting the driver on the shoulder and we went on. About half an hour later we stopped at the vulcanisation where the staff took another wheel, telling us – impatient travelers – that they would pick it up on the way back. But about nine o’clock, while eating another breakfast, the nearby vulcanisation took care of our circle and its glueing with the accompaniment of the Hindu crowd. My sisters besides eating, dealt with small but bold Indian girl, daughter of the owner of the shop, which was in possession of a fascinating toy made by dad – a stone tied with a string. At last we went further and – according to information – we planned to reach Belahiya at 11 pm. We did not stop anymore, except for an object that probably was a post office – bus service dropped a dozen bags looking like letter bags. By the time we got to the border, we were still passing some small towns, and one by one, someone was getting off. Eventually we got around 11.30 pm on the spot. 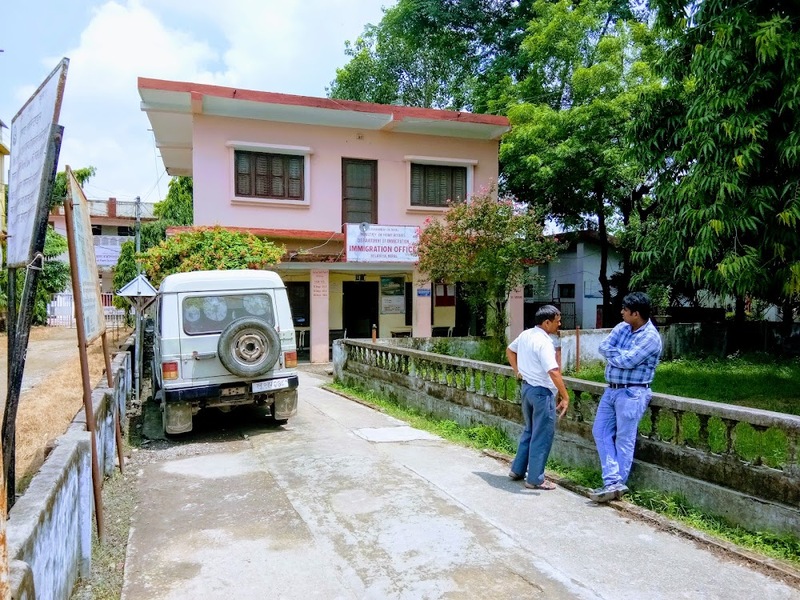 We immediately went to the Nepal Imigration Office, dropped our backpacks there – and since there were so many people – we went to eat the last momo and spend the last Nepali rupees. Then we filled out our forms, checked out from Nepal and went to the border. And here’s the news – the new security arrived checking backpacks and us – this never happened in this place before. The service did not look so delighted with their function and they did everything quickly, which did not change the fact that our neatly stuffed belongings had to be re-composed what and where to put it. We’ve been checked carefully. In the end we finally went on and just behind the gates with the Indian security, the world changed. The smell reminded India. We checked in at the Indian Imigration Office, where we were once again experiencing a temperature shock. After about two hours spent in cross-border heat we entered a room where several fans were concerned . 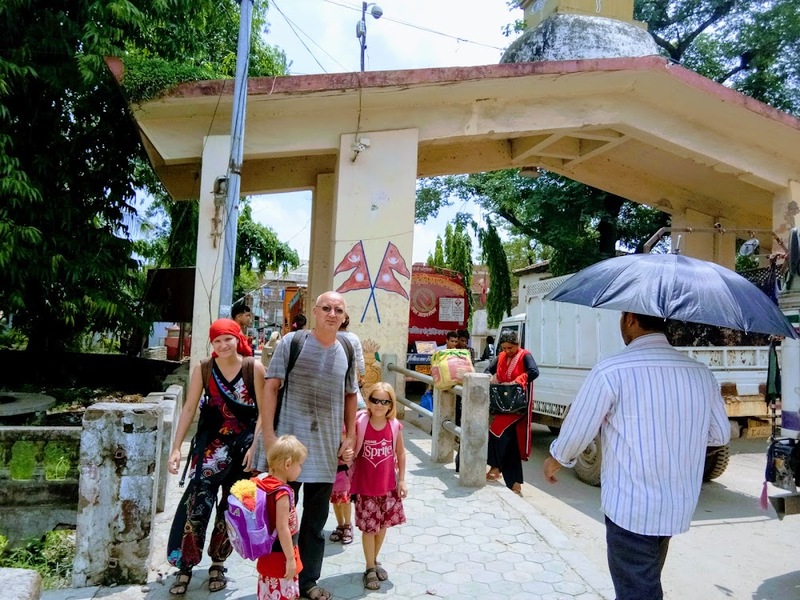 With the stamps in our passports we went to get on the bus to Gorakhpur – the nearest transport hub. Ticket – 99 NRS per person. It leaves – according to data from the Indian Imigration Office – every 15 minutes. The city was 90 km away, which meant three hours of travel. In fact, we got to the Gorakhpur train station after about four hours, as the bus passed trough the entire city.